With the West London area overflowing with footballing tradition, it's no surprise that Queens Park Rangers Football Club were mostly overshadowed by their neighbors during their lifespan. The club's only major honor is the 1967 League Cup, but they do have a couple of Second Division titles to their name as well. QPR have a reputation of a nomadic club; during their early years, they have played at about twenty different grounds before, more or less, settling at Loftus Road in 1917. QPR should not be confused with Queen's Park Football Club that plays in the Scottish League. Queens Park Rangers' home ground in 2014. The club was officially formed in 1882, under the name of St. Jude's. Four years later, they merged with Christ Church Rangers and subsequently changed their name to Queens Park Rangers, due to most of their players hailing from the Queen's Park district. The club became a member of the Football League in 1920, but was not particularly successful during the decades that followed, spending most of their time in the lower ranks of English football. Their luck finally changed with the arrival of Alec Stock in 1959. Now regarded as the club's greatest manager of all time, Stock made his presence known from the get-go; in the season that followed, QPR achieved their record victory by routing Tranmere Rovers 9-2. But it was not until 1967 that Queens Park Rangers really made a name for itself. The club won a double by placing first in the Third Division and defeating West Bromwich Albion in the League Cup final after being down 2-0 at halftime. The very next year, QPR managed to earn promotion to the First Division for the first time in their history. The best result in the top league was reach in 1972 with a second place, one point after Liverpool. 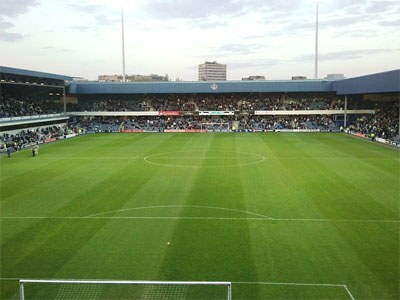 In 1981 QPR became the first football club in Europe to install an plastic pitch (or artificial turf, in this case called Omniturf) at their stadium. The plastic pitch were however abandon for normal grass again in 1988. The 1991/92 season was another hallmark for the club. In addition to placing 11th in the First Division – thus earning the invitation for the newly-formed Premier League – QPR also recorded one of their most sensational victories by outclassing Manchester United 4-1 on New Year's Day. The club followed it up by finishing fifth in the inaugural Premier League season. After a decade of internal struggle, the club was bought by Bernie Ecclestone and Flavio Briatore in 2007. On the back of their newfound financial stability, QPR became a regular guest in the Premier League. QPR has used three dissimilar logos in the history of the club. In 2016, the club decided to change back to the logo used between 1982 and 2008. The new version, however, had some slight modifications and was a bit simplified including the discard of the banner.